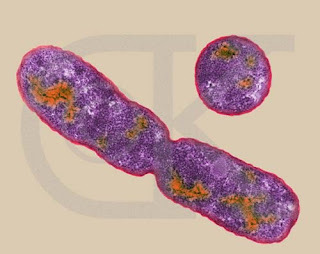 We all know “Shigella” a common gut pathogen. Shiga toxin is a virulence product, main culprit of shigellosis. Since I have read the paper by Mukhopadhyay, published in science I desperately wanted to write about this toxin (For the paper link look at further reading section). 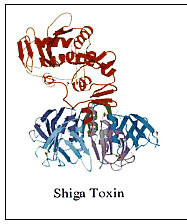 Basically, Shiga toxin is a 2 domain (A-5B) structure. Shiga toxin is the prototype of the Shiga toxin family (Oh he has a family too!!) and almost identical to the Stx1, differing by just a single amino acid (Oh now that’s quite close). Remember, Shiga toxin Stx is produced by Shigella dysenteriae; Stx-1 and Stx-2 are produced by E coli strains. It’s well known to all of us, that the shiga toxin enters via a macropinosome and functions as an N-glycosidase, cleaving a specific adenine nucleobase (position 4324) from the 28S RNA of the 60S subunit of the ribosome, thereby halting protein synthesis. The most common pinosomal entry is via clathrin coated pits. But here’s something that many of us don’t know. The target of ricin and shiga toxin is the 28S RNA of 60S subunit (Lot of implications, especially in cellular transport pathway research). The A moiety of shiga toxin is processed by furin. Furin is a ubiquitous subtilisin-like proprotein convertase. It is the major processing enzyme of the secretory pathway and is localized in the trans-golgi network. Shiga toxin is transported in a retrograde method to the endoplasmic reticulum. In summary, the A chain produces the toxic effect and the B chain helps in binding. Fig taken from Clare etal. Bacterial Toxins: Friends or Foes; Volume 5, Number 2—April 1999. Emerging Infectious diseases. Blocks absorption (uptake) of electrolytes, glucose, and amino acids from the intestinal lumen. Research has dug variety of ways, from vaccination to blockers to try and quarantine this poison that causes many hospitalizations. However, a recent research by Mukhopadhyay has speculated that this isn’t as complicated as others are trying to show it. Metal manganese (Mn2+) blocks endosome-to-Golgi trafficking of Stx and caused its degradation in lysosomes. Mn2+ targets the cycling Golgi protein GPP130, which Stx bound in cells during sorting into Golgi-directed endosomal tubules that bypass lysosomes. Sorting into the Golgi-destined membrane tubules which depends on Shiga toxin binding to GPP130. Manganese protects cells by down-regulating this crucial point- “GPP130”. Without GPP130 to bind, Shiga toxin does not enter the endosomal membrane and is now available for degradation in lysosomes. So next time someone says “He’s suffering from shigellosis” give him manganese containing foodstuff. A variety of healthy foods provide this including Raspberries, pineapple, nuts, spaghetti, oat bran etc. 1. Somshuvra Mukhopadhyay, Adam D. Linstedt. Manganese Blocks Intracellular Trafficking of Shiga Toxin and Protects Against Shiga Toxicosis. Science 20 January 2012: Vol. 335 no. 6066 pp. 332-335. I have been told that am writing only on resistance and antibiotics. So this time, for a change am writing on HERV (Human Endogenous retrovirus). Believe me when I say this we all got at least an 8% of our genome filled with retroviral gene as part of evolution. Alas!!! That’s incredibly huge amount. All humans carry a sequence of human endogenous retrovirus (HERV) as an integral part of their genomes. They are remnants of ancestral infections by retroviruses that have infected the germ-line cells and retained in the gene pool via Mendelian mode of inheritance. The integrated viral DNA is characterized by long terminal repeats (LTR) flanking gag, pro, pol, and env genes. The HERV’s are implicated in human evolution, certain autoimmune diseases, cancers, in pregnancy formation of the placental syncytium and many other roles. The human genome project found several thousand ERVs which were classified into more than 24 families. The discovery of ERV took place in the late 1960s and early 1970s. Three types of ERV were found around the same time: avian leukosis virus in the domestic fowl (Gallus gallus), murine leukemia virus and murine mammary tumor virus in the laboratory mouse (Mus musculus). Initially, ERV were discovered by combining virological and immunological methods with Mendelian genetics. Their existence was then confirmed by nucleic acid hybridization. The ERV’s are grouped into 3 groups- I, II and III on the basis of sequence similarities with each type. Each type is sub classified into many subtypes based on specificity of tRNA primer binding site. Class I are related to Gammaretroviruses, Class II with Betaretroviruses and Class III with Spumaretroviruses. The Class I and III are found in primates, while class II is found to be active recently. A few of class II subgroup HERV-K have been found to be human specific. An interesting property of the majority of the ERV is that they don’t readily re infect the cells from which they are derived, but can infect other species in vitro and invivo. The feature is known as xenotropism. The possibility of HERV as etiology of disease is manifold. For instance, HERV-W or more commonly known as MS- associated retrovirus (MSRV) is found to be linked with Multiple Sclerosis. (Now that’s just a research hypothesis. No definitive proof as far as I know). Research has also pointed that the HERV is possibly related to HELLP syndrome, Preeclampsia, Schizophrenia etc. If that makes you believe that HERV is just engineered into us to cause problems, there is an alternative angle of look into HERV. It is their beneficial roles in humans. The molecular biologists are now more aware of the importance of physiological roles of the ERV in the cell. The most important among them include coding of proteins in reproductive tissues and embryo. Aha, so we humans are born because virus makes things for us to be born. Infact the placental membrane is designed by the viral protein. The “Telomerase” which is important for the viability of stem cell is a retroviral enzyme. In brief, the HERV’s integrated into the genome pool of various species and remained latent, and a few of them encoded important proteins to the host. The potential damaging sequences then underwent silencing and remained as fossil remnants. Their study helps in construction of a possible phylogenetic tree and serves as a molecular clock. The potential for a more exhaustive research is high, which will guide us in stripping the hidden details of evolution and the mysteries of many diseases. Anders L Kjeldbjerg, Palle Villesen, Lars Aagaard and Finn Skou Pedersen. Gene conversion and purifying selection of a placenta-specific ERV-V envelope gene during simian evolution. BMC Evolutionary Biology 2008, 8:266. doi: 10.1186/1471-2148-8-266. Mangeney M, Renard M, Schlecht-Louf G, Bouallaga I, Heidmann O, Letzelter C, Richaud A, Ducos B, Heidmann T: Placental syncytins: genetic disjunction between the fusogenic and immunosuppressive activity of retroviral envelope proteins. Proc Natl Acad Sci USA 2007, 104:20534-20539. Every cell, a prokaryote or eukaryote has to sense its environment and adjust accordingly. In addition the cell should also be able to communicate with other cells. Quorum sensing is a system of stimulus and response correlated to population density. This is used as a chemical language by bacteria and fungus to talk. 2. TED talk- Bonnie Bassler on how bacteria "talk"
The readers are advised to take a look into the talks which would give you the background information needed to read on (Am lazy enough, to not review it and post it here. Anyways the link is there). So here’s the deal. Each bacterium decides to survey the surrounding and keep a record of number so as to decide what next. Several classes of such signal molecules have now been identified. So if there are a large number of molecules I need to classify that right? Ok. So here it is. 1st group is amino acids and short peptide derivatives, commonly utilized by Gram-positive bacteria and 2nd group is fatty acid derivatives, called homoserine lactones (HSLs) utilized by Gram-negative members. Another system that communicates is the toxin antitoxin system. 1. The mazEF locus of Escherichia coli is located in an operon together with the upstream relA gene which encodes an antitoxin/toxin system which is supposed to play a role in programmed cell death under stress and starvation conditions at high cell densities. 2. Escherichia coli mazEF-mediated cell death is a population phenomenon requiring a quorum-sensing molecule called the extracellular death factor (EDF). 3. Any stressful condition that prevents the expression of the chromosomally borne mazEF module will lead to the reduction of MazE in the cell, permitting toxin MazF to act freely. So what sense does the above 3 make? You guessed it right! At high population densities the E coli produces EDF which activates the mazEF and induces cell death. This helps other cells to survive and keep the population in control at low energy availability and high density. Now what if we can cheat the talk???? He he he.. That’s what exactly happens in action of Rifampicin unlike previously thought. Rifampicin was thought to arrest the growth of bacterial cultures by generally inhibiting cellular transcription by interfering with the activity of its primary target, RNA polymerase. But now we know rifampicin arrests the growth of bacterial cultures by inhibiting cellular transcription by interfering with the activity of its primary target, RNA polymerase. The activation of MazF requires the quorum sensing factor Extracellular Death Factor (EDF). So the take home message is that by using specific death inducing factors (EDF in above case) along with other antibiotic we could actually reduce the antibiotic resistance. The quorum sensing being a vital phenomenon, the bacteria would evolve resistance slowly, though of course I do think resistance will come. 2. Ilana Kolodkin-Gal and Hanna Engelberg-Kulka. The Extracellular Death Factor: Physiological and Genetic Factors Influencing Its Production and Response in Escherichia coli; J Bacteriol. 2008 May; 190(9): 3169–3175. With the above knowledge let me start. A certain well defined group of organisms exist called as Archaea. They were previously thought to be a member of bacteria (Now we known they are not). From one of these archaea, scientists were able to isolate a compound called Halocins, (first discovered in 1982). Over the years several halocins have been purified and characterized and three halocin genes coding for H4 (halH4), S8 (halS8), and C8 (proC8) have been cloned (Gosh, Every gene the scientists identify they will clone it!!!). Halocins may be small peptides (Microhalocins) or large proteins (No alternative name as Macrohalocins?). So why have they caught my attention? The reason is they have a wide range of activity against many varieties of bacteria. Halocins are produced by the bacteria in its stationary phase of growth. This is possibly according to my opinion due to the less availability of various biological requirements (Otherwise the cell should have been in exponential phase) and should make sure their environment is not giving way to other bacteria's to have fun (Makes sense at least to me). Halocin H1 is an exception to this. Another feature of interest is these halocin pre-proteins is transported by "Twin Arginine Translocation Pathway". So what are the applications? The research is slowly evolving and we are just beginning to understand.A unique mode of action is that they have a pore-forming action (Kind of drilling the cell wall with a driller), production and maintenance of energetic ion gradients across the membrane which is quite lethal to other bacteria. H7 is shown to inhibit the Na+/ H+ antiporter. So they can also be used in treatment of repurfusion injury. 1. Mei S etal. The helix-loop-helix motif at the N terminus of HalI is essential for its immunity function against halocin C8. J Bacteriol. 2008 Oct;190(19):6501-8. 2. O'Connor EM, Shand RF. Halocins and sulfolobicins: the emerging story of archaeal protein and peptide antibiotics. Give me a new antibiotic buddy..
Prokaryotes mainly divide by binary fission. It’s a simple elegant process where the organisms duplicates its genome, and makes two cells from the parental cell. Unlike the higher cell division mechanisms, here the only requisite is equal segregation of genome to daughter cells (Now I really don’t know why daughter cells, why not son cells!!). The cell doesn’t care about rest of the cellular components (If DNA is there it can make it all in prokaryotes). Sure, that’s a cool idea. The antibiotic would be novel, good activity as the target is essential part of the cell. But will this be useful enough? Assume that a compound X has successfully inhibited the process specifically. The first thing that’s going to happen is the E coli divide but cant form 2 cells. After a few rounds the cell is going to mess up everything and then stop the process or die, (either way the number of bacteria isn’t going up). What about resistance? Well, as I see it the cell should undergo a natural selection to become resistant. Am I right? But how will it, if the cell is not making new ones. Bingo!!!! Bang on the target. The only problem i see, which is possible is that cell gets mutated and makes a new protein which isn’t affected by the drug as time goes (remember, the cells haven’t replicated. Only the DNA has. But that doesn’t mean the cell DNA cannot mutate). And then this new protein can now release the block that can suddenly cause a burst in the cell division (Now not binary fission. It should be some 500nary fission). Ofcourse, this is my speculation. More research in the area should say something and spread more light on this. 2. Prerna N. Domadia, Anirban Bhunia, J. Sivaraman, Sanjay Swarup and Debjani Dasgupta. Berberine Targets Assembly of Escherichia coli Cell Division Protein FtsZ Biochemistry , 2008, 47 (10), pp 3225–3234.